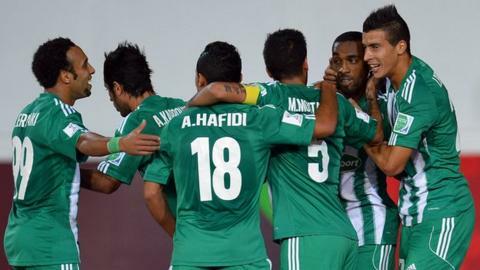 Morocco's Raja Casablanca and Egypt's Al Ahly will be in action in the Club World Cup quarter-finals on Saturday. Ahly face China's Guangzhou Evergrande in Agadir for a place in the semi-finals against Germans Bayern Munich, who received a bye into the last four. Agadir will then host the other quarter-final between Casablanca and Mexico's CF Monterrey. The winners of that match will face Atletico Mineiro of Brazil, who also received a bye into the semi-finals. The regional champions from each of the Fifa regions are gathering in north Africa to decide which is the best domestic team in the world. In the opening game on Wednesday, Raja Casablanca beat Oceania's representatives Auckland City FC 2-1, with Abdelilah Hafidi scoring a late winner for the host club. Bayern are favourites to lift the trophy in Marrakech on 21 December with the Bavarians aiming to win their second piece of silverware under Pep Guardiola after winning the Uefa Super Cup by beating Chelsea in a penalty shoot-out in Prague in August.